My GMO Activism Story to Eliminate GMOs from your Life! 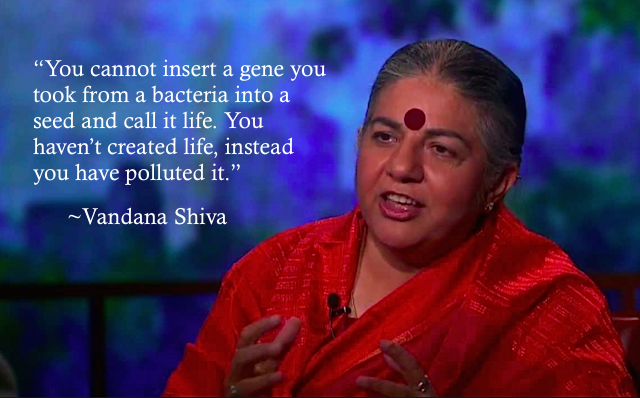 Eliminating GMOs from your life can be easier than you think. Check out my video (above) and download My Top 5 GMO Swaps & Drops to uncover some of the worst offenders and how to swap them out. About 20 years ago, I had an interesting encounter with one of my favourite Canadian celebrities. I was a co-operative owner of The Big Carrot Natural Food Market at the time and one of my tasks as In-Store Nutritionist was to organize events that pertained to health. Dr. David Suzuki honoured us with a presentation at one of these events, where I asked him if he would autograph one of The Big Carrot’s signs as a memento. Our motto, “Searching For Nature’s Finest”, was proudly written across the sign I asked him to autograph, and as the gracious Dr. Suzuki scrawled his name across the sign he turned to me and asked, “Is this true?” “I’m sorry?” I asked, looking confused. Dr. David Suzuki was calling me into action, and I decided I’d better pay attention. I began studying, and what I found shocked and angered me! I realized that our store could not claim to be “Searching For Nature’s Finest” while carrying products that contained GMOs and the broad-spectrum, systemic herbicide Glyphosate [N-(phosphonomethyl)glycine] which is now known to cause birth defects and diseases, such as cancer. Customers were relying on us to provide them with the best food we could obtain. Fortunately, The Big Carrot co-owners completely agreed and in the summer of 1998 we took on a huge project. Our goal? To become a GMO-free store. What I was soon to learn was that although we could strive to create a non-GMO purchasing policy, claiming to be a completely GMO-free store was not legally possible. We knew that products containing canola, corn, cottonseed and soy presented the biggest problem, as these were the most common GM crops. We were relieved to find out that even though potatoes and tomatoes had been genetically modified, none being grown at the time. Our staff sent letters to manufacturers asking them to declare, on their letterhead, that their products were non-GMO. If a company could not assure us that a product was free of genetically modified organisms, the product was removed from our shelf. We had a total lockdown on any product that was problematic, such as anything with corn, cottonseed, canola or soy. In the end, we removed roughly 20% of the products on our grocery store shelves because they were suspected to have GM ingredients. The only exceptions to this rule were products containing Vitamin E, which is derived from soy; Vitamin C, which is derived from corn; and soy lecithin. GM levels in these products were considered nearly undetectable, and removing these products would have emptied much of the store. While the process of removing foods containing GM ingredients was arduous, the results were positive. We’ve had a 12% increase in sales despite selling 20% fewer products! Our ban helped force the natural health food industry in North America to use better ingredients and response from the public was overwhelmingly positive. Note: The Big Carrot GMO ban officially began in 2000 and is an ongoing project. Staff members spend a combined 100 hours each year keeping it up-to-date. One of my oldest and dearest friends, Maureen Kirkpatrick, heads up the Standards Committee and maintains the organic standards for the store. She works tirelessly to 'raise the bar' and as a consumer, I am incredibly grateful that, in addition to GMOs, The Big Carrot has banned products containing artificial colours, hydrogenated oils and artificial sweeteners. The Big Carrot is now a safe haven, where you can come and shop with confidence. In 1999, I was given the opportunity to speak to the Federal Government of Canada in Parliament about the health risks of Genetically Modified food. The CHFA (Canadian Health Food Association) fed MPs an amazing, organic meal from a local, organic, vegetarian restaurant called, The Green Door, to demonstrate that healthy, organic food tastes great. My message to government was that GMOs are not substantially equivalent (meaning, the same as regular food), denying the most important claim used by industry to convince our government to rubber-stamp approval of GMO foods. 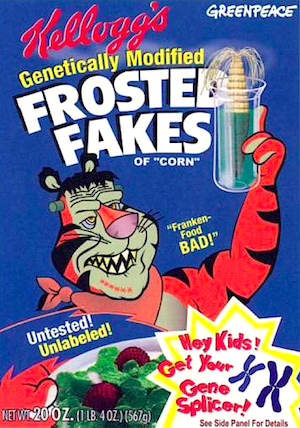 GMO food is not substantially equivalent as it has virus vectors, antibiotic resistance marker genes, higher potential for allergenicity and a different nutritional makeup. I felt that if I could demonstrate that GMO food was not substantially equivalent, then they would, at least, have to label it. The message I delivered and the food we provided was well received, though we soon realized that if we wanted to make changes to our food system, taking the issue to parliament wasn’t going to make much of a difference. Customers needed a chance to vote with their wallets; first, we needed to get them the information they needed to make an informed choice. The demand for safe, healthy food had to come from grassroots, ‘gardening boots on the ground’ projects. While the Big Carrot team was working hard to clear our store of GMOs, a team of activists made some noise in the streets. 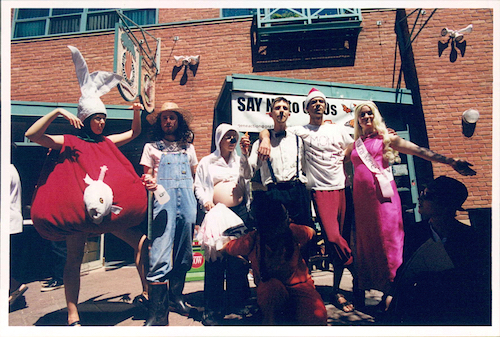 A group of my theatre friends had formed, Gene Action, a Toronto-based crew that focused on reducing and, eventually, eliminating Genetically Modified food in North America. Activities included direct action, street theatre, research, workshops and public outreach. It was an engaging and joyous project that had its ups and downs. We marched through the streets of Toronto, up to Parliament Hill in Ottawa, and in and out of stores, festivals and public events. One of my more memorable events happened at my local Loblaws grocery store. 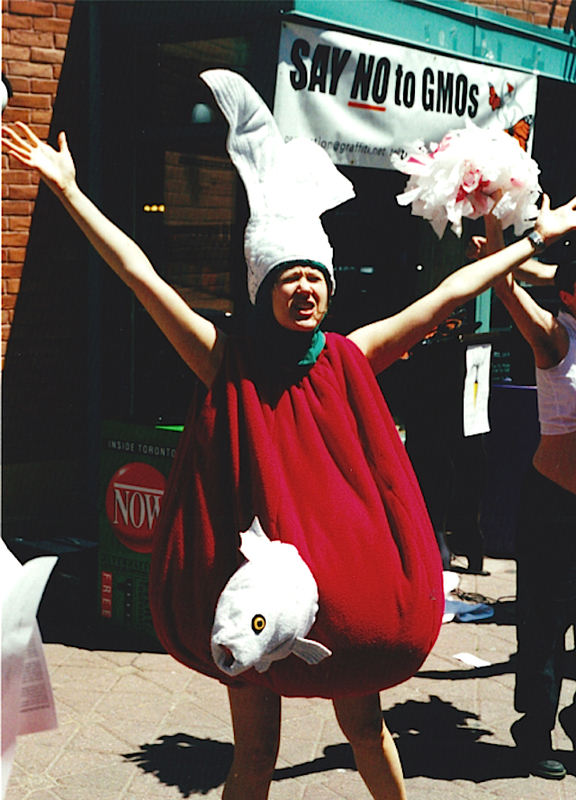 Our Gene Action team walked into the store as normal customers, donned colourful costumes and staged a spontaneous theatre piece that spoke to the dangers of GMOs. While customers were intrigued, Loblaws staff was not pleased. After I stood on top of the conveyor belt by the cash register to make a mighty announcement, “I am a Fishy GMO Tomato. Go ask the manager to stop carrying GMO food in this store”, police were called and I was thrown out of the store. We were given a 'trespass notice' and I was told to never set food in a Loblaws again… banishment I wear, proudly. 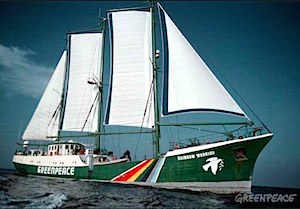 One of my greatest joys to date has been serving on Greenpeace's tall sailing ship, The Rainbow Warrior, during its GE-Free New Zealand Tour of 2001. I was honoured to cook for 31 Scottish, Canadian, German, Australian, Dutch, Japanese and Mexican campaigners against Genetically Modified food. It was a real culinary challenge to satisfy the diversity of palates. Fortune allowed me to reconnect with Lindsay Keenan, the Scotsman who led the charge, through a powerful, grassroots campaign, for the UK to rid itself of GMOs. It's wonderful that New Zealand is now a true safe haven for heritage seed varieties by being one of the first countries to completely ban the growth of GMO crops! 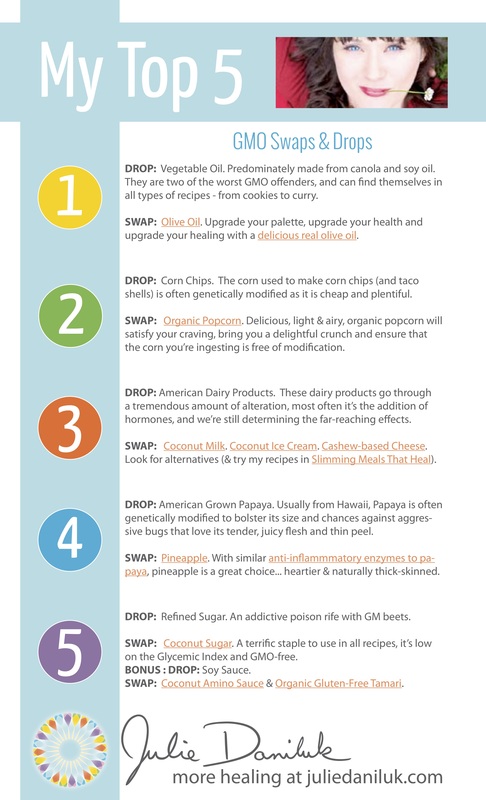 For Greenpeace Canada's 'How to Avoid GMO Shopping Guide', click here. 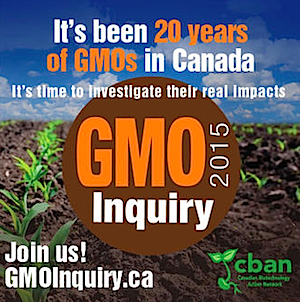 In 2002, Christie Young, Lucy Sharratt (director of CBAN.ca), myself, Greenpeace, Council of Canadians, Polaris Institute, Institute for Social Ecology, Gene Action and many other key players, co-created one of the largest GMO action events in Canada. Three thousand attended our bioJustice-bioDiversity Festival (sponsored by The Big Carrot), the 6th annual grassroots gathering on genetic engineering. I took 2 months away from my duties at The Big Carrot to focus on organizing (with my dear friend, Christie Young, director of www.farmstart.ca) organic food, live theatre, the eco market (where I first locked eyes with my future husband, Alan Smith) and music that provided the setting for Dr. David Suzuki’s keynote address. After Dr. Suzuki had thrown down the gauntlet years before, we knew he was the perfect person to speak about the need for caution when it came to genetically modifying our food. Dr. Suzuki is a leading expert in the field of genetics. His genetic textbook had been translated into dozens of languages and is taught in most university genetic programs throughout the world. 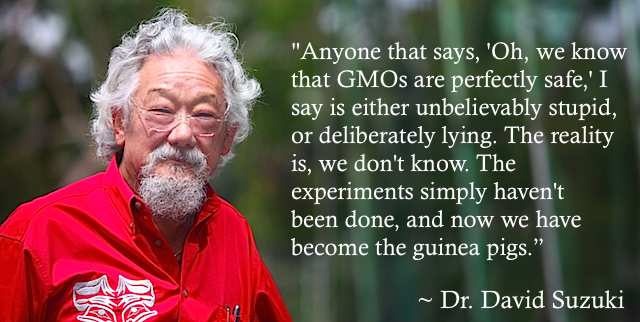 To read about Dr. Suzuki's take on GMOs, click here. The idea behind The Non-GMO Project started in 2003 in a small, neighbourhood natural grocery store in Berkeley, California called The Natural Grocery Company. In response to letters from customers who were concerned about GM soy lecithin that the store was carrying, a group of employees initiated the “People Want to Know Campaign.” This effort rallied 161 grocery stores and co-ops throughout the United States in a letter-writing campaign to manufacturers of natural food products and supplements in the U.S. The goal was to discover the GMO status of products, so that consumers could be offered an informed choice. The results of the campaign were mixed, with a central problem being the lack of a consistent, industry-wide standard for what non-GMO was. Up in Canada, we had started our GM ban in 2000 by discontinuing products that were not confirmed by the manufacturer to be GMO-free. Though this was a successful move, the absence of an authoritative standard for non-GMO made the task that much harder. While our southern neighbours were looking for a more comprehensive and reliable way to identify Non-GMO products, we, North of the border, were looking for the same thing! 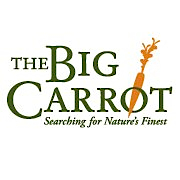 In 2005, The Natural Grocery Company and The Big Carrot Natural Food Market teamed up to form the Non-GMO Project, with a common goal of creating a standardized meaning of non-GMO for the North American food industry. To give the Non-GMO Project the rigorous scientific foundation and world-class technical support necessary for this endeavour, our stores began working with the Global ID Group, a world leader in non-GMO testing, certification and consulting. In the spring of 2007, the Non-GMO Project expanded its Board of Directors to include representatives from all stakeholder groups in the natural products industry, including consumers, retailers, farmers and manufacturers. Working to give the Non-GMO Project a solid foundation comprised of as many perspectives as possible, this dynamic board then formed advisory boards for both technical and policy issues. The Non-GMO Project Board members included Michael Funk, CEO, United Natural Foods, Inc.; Joe Dickson, quality standards and organic program coordinator, Whole Foods Market; Arran Stephens, CEO, Nature’s Path Foods; Michael Potter, CEO, Eden Foods; Grant Lundberg, CEO, Lundberg Family Farms; George Siemon, CEO, Organic Valley; Mark Squire, owner, Good Earth Natural & Organic Foods; Bob Gerner, owner, Berkeley Natural Grocery; Julie Daniluk, member/owner, The Big Carrot Natural Foods Market (Toronto, Canada); Megan Thompson, executive director, The Non-GMO Project; and John Fagan, chief scientific officer, FoodChain Global Advisors. 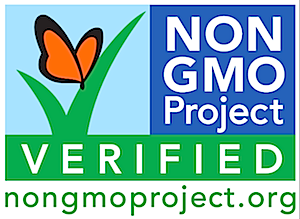 Straus Family Creamery, United Natural Foods, Eden Foods, Lundberg Family Farms, and Nature’s Path Foods were the first companies to participate in The Non-GMO Project’s verification process. Since then, the Non-GMO Project has grown into an international movement. In Canada, no one has worked harder to provide the most up-to-date research and tools of activism then Lucy Sharratt (creator of CBAN). Other ways I'm involved... and you can be, too! Of course this is only a brief snapshot of some of the non-GMO activities that I am fortunate to be connected to in North America. The global movement against the use of this technology is growing by the day. Millions of people all over the world are coming together to say “No!”; we owe it to the next generation to pick up the gauntlet and fight for our right to eat real, authentic, unmodified food. I urge you to click on links throughout this article and take action with your wallets, your vote and most of all, your heart! The Canadian Biotechology Action Network (CBAN) began in 1999 when 23 environmental, social justice and consumer groups agreed to share information and coordinate common actions on issues raised by genetic engineering such as the need for democratic debate, precautionary decision-making and mandatory labelling, as well as issues surrounding regulation, sustainable farming and corporate control in agriculture. Through national meetings in 2006, a consensus created CBAN to assist research and monitoring, support grassroots action and coordinate action at the national and international levels. To learn more about the dangers of GMO’s and how to activate your passion for change, I highly recommend reading their website from front to back! While you are there, make a donation to pledge your support for their work as they are the front line of the GMO fight in Canada and are majorly underfunded! Genetically Modified Pigs : CBAN's sustained national campaign succeeded in shutting down research in the GM pig (called "Enviropig") in 2012. Terminator Seeds : International Moratorium Maintained, March 31, 2006. At a major UN meeting in March 2006, CBAN worked closely with the peasant movement, Via Campesina, and groups and movements from around the world for the international Ban Terminator campaign. Genetically Engineered Wheat : Monsanto withdrew application for approval in 2004, after farmers and farm organizations in Canada made it clear that GE wheat would ruin their export markets, and consumers made it clear they did not want to eat Monsanto’s herbicide resistant wheat. Bovine Growth Hormone : Health Canada denied Monsanto approval in 2004, after 10 years of protest from farmers and consumers across Canada led by CBAN members, the National Farmers Union and The Council of Canadians. The Institute for Responsible Technology is a world leader in educating policy makers and the public about genetically modified (GM) foods and crops. They investigate and report the risks and impact on health, environment, the economy and agriculture, as well as the problems associated with current research, regulation, corporate practices and reporting. Founded in 2003 by international bestselling author and GMO expert Jeffrey Smith, IRT has worked in nearly 40 countries on 6 continents, and is credited with improving government policies and influencing consumer-buying habits. IRT's work comes from a dedicated team of subject experts, consultants and staff who donate their time and experience. Their website has become one of the most respected resources for online videos, podcasts, blogs and reports for accurate and up-to-date information on GMOs. To watch Jeffrey Smith's movie, Genetic Roulette – The Gamble of Our Lives, click here. To order Jeffrey Smith's book, Genetic Roulette: The Documented Health Risks of Genetically Engineered Foods, click here. The Millions Against Monsanto campaign was started by the Organic Consumers Association (Director Ronnie Cummins) in the mid 1990s (one of the first!) to fight back against Monsanto and other biotech companies who are responsible for creating Agent Orange, PCBs, Roundup (glyphosate) and other toxins that threaten human health and the environment. For nearly two decades, Monsanto and corporate agribusiness have exercised near-dictatorial control over American agriculture. Millions Against Monsanto is fighting back. For more information on their campaign, click here. GMWatch is an independent organization that seeks to counter the enormous corporate political power and propaganda of the GMO industry and its supporters by providing the public with the latest news on genetically modified (GMO) foods and crops (through its website, email lists, social media and other outreach and campaigning activities). GMWatch (founded in 1998) isn't funded by big business, government or political parties. It is mostly funded by donations from individual supporters and receives some modest funding for aspects of its work from a small number of NGOs and charitable foundations or trusts, and by the work of dedicated volunteers in different countries around the world. For more information about GMWatch, click here. Canadian Organic Growers (COG) is a national charitable organization with members in all regions of Canada. COG is connected to the regions through eight regional chapters, four affiliated organizations, and to the international organic community through membership in the International Federation of Organic Agriculture Movements (IFOAM). COG's membership is diverse and includes farmers, gardeners, processors, retailers, educators, policy-makers and consumers. Not all COG members run certified organic operations, but they share a vision for a sustainable, bioregionally-based organic food system. Organic Week : an annual celebration of organic agriculture held every September. Organic Production Systems General Principals and Management Standards and Organic Products Regulations. Seeds of Diversity Canada : A grassroots seed-saving heritage program to protect the biodiversity of our food crops. For more information about COG, click here. 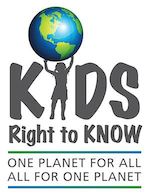 Founded on the belief that we all have the “Right to Know” what’s in our food, regardless of age, Kids Right to Know seeks to inform, educate and motivate kids to stand up and make a difference. This is the website of Rachel Parent who has been advocating for GMO labelling in Canada since 2012. For more information, click here. 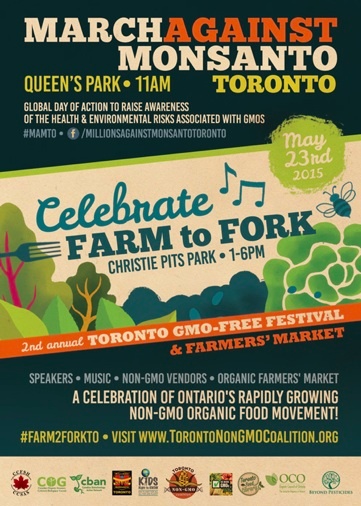 For Toronto Non-GMO activities, check out the Toronto Non-GMO Coalition. Farm-to-Fork Toronto, a GMO-Free Festival focusses on increasing awareness about the environmental and health risks associated with GMOs, provide consumers with the facts and empowering them to take action in their communities, while celebrating safe food options and honouring the farmers and businesses who work so hard to provide them! Attend this, and other community events, to connect with concerned citizens, organic foodies, farmers, beekeepers, well-researched speakers, socially-conscious musicians, local non-GMO and organic food vendors, environmental defenders, food safety advocates and seed freedom warriors.